Data center nerds got two big announcements today with both Google and Facebook announcing big projects. 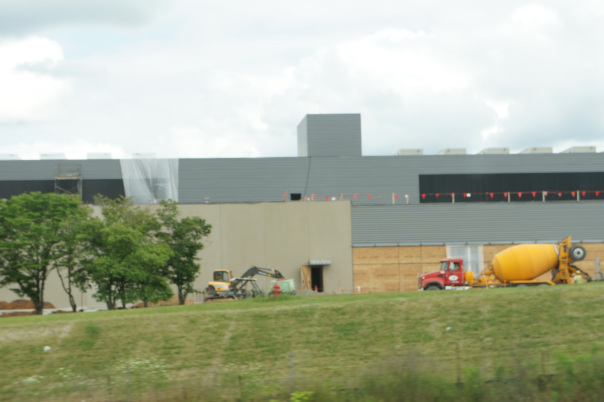 Facebook’s new data center construction in Iowa is the fourth data center for the search giant, while Google’s Iowa expansion carriers a higher price tag. But the dueling news releases also highlight a growing infrastructure rivalry between these web giants. Facebook formally announced the construction of a new data center in Altoona, Iowa. Construction on the first phase will begin this summer and your Facebook likes and photos will start traveling over the data center in late 2014 according to Tom Furlong, vice president of site operations at Facebook (s fb). He said that while newspaper reports placed the value of the center at $1 billion to $1.5 billion, he’s unsure where those figures came from. This first phase will cost $300 million and result in a 476,000 square-foot data center. That square footage includes both offices and floor space. Like Facebook’s data center in Lulea, Sweden the hardware inside will be built for Facebook to its Open Compute standards. 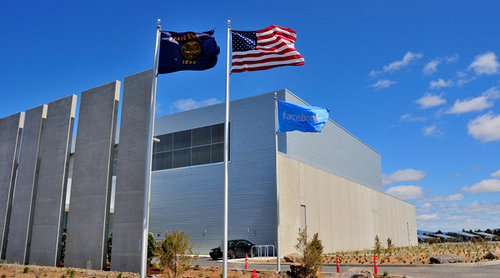 Facebook’s data center in Prineville, Ore. When I asked Furlong if the Altoona data center would be built for disaster recovery purposes — as some of my sources had suggested — he told me, “we’re in the N+1 mode,” meaning he was building out capacity beyond what he needs to serve customers. While Furlong was clear that the data center would be more than just a failover site for Facebook’s Prineville, Ore.; Forest City, N.C.; Lulea, Sweden or leased data center space, it would represent excess capacity that could still support traffic from other sites if a region failed. He also alluded to mechanical, electrical and networking improvements, but other than saying that servers handling similar products would be grouped together he declined to get specific. But I’m hoping his boss, Jay Parikh, the VP of infrastructure engineering at Facebook who is speaking at Structure in June will share the details. On the capital investment side, Facebook said in its 10-K filing that it planned to spend $1.8 billion in capital expenditures in 2013. When asked if this data represented a large chunk of that, Furlong said it didn’t. AND at $300 million it probably wouldn’t, especially if servers and gear wouldn’t make it into the data center until 2014 as Furlong suggested. But in a curious bit of timing, Google today said it would expand its Iowa data center operations in (relatively) nearby Council Bluff, Iowa. The search giant will spend $400 million building out its existing data center operations, bringing its total spent in the area to $1.5 billion. The data center houses computer systems and associated components that support services such as Google Search, Gmail, Google Maps and Google+. In the data center world, the growing rivalry between Google and Facebook is common — if quietly addresses –knowledge, which is why the timing of Google’s announcement seems designed to steal Facebook’s thunder. However, Google’s spokeswoman attributed the timing to an Iowa Economic Development Board meeting held this morning, where the board approved incentives for both Facebook and Google. However, it’s no secret that Facebook has been stealing pages from Google’s book and is also pushing for more openness than it’s famously “open” rival. Facebook’s Open Compute project announced in April 2011 clearly found inspiration in Google’s own efforts to build its own hardware to maximize efficiency. With Open Compute, Facebook took Google’s basic idea and opened it up to masses after putting considerable engineering talent behind it. That’s only one example. Facebook has also been open about how it builds and operates its data centers, which has led to many of those in the industry to start releasing their own data. For example, after Google published a blog post last year noting the power usage effectiveness ratio for its data centers, Facebook countered with an email indicating the differences between its calculations and Google’s. Microsoft also was quick to respond with details on its own PUE calculations. Facebook’s Forest City, North Carolina data center. That type of data has now become a PR battleground for many of these companies. And while it’s a game Google seems reluctant to play, it’s one that it has resigned itself to. Industry insiders note that Google is opening up as Facebook pushes the envelope on transparency. The search giant’s appearance and presentation last November at an industry conference that shared seven years of knowledge gained at Google, plus its invitation of a CBS news crew to tour its data center in North Carolina (where Apple and Facebook both have data centers and our own Katie Fehrenbacher was yelled at for snapping a picture) are a few examples. These steps are unheard of for the search giant, which is famous for holding its infrastructure details close to the vest. In the CBS video, Google’s infrastructure czar Urs Hölzle said that the tour granted to the CBS crew is the only time he’ll allow cameras into the data center. Google once asked me to avoid using a picture of a slide I had taken at a conference that showed a switch it had designed. I didn’t run the picture, but that was because it was blurry. So as Facebook pushes Google, perhaps Google is now pushing back a bit today with its own Iowa news. Google’s is a bigger project announcement, coming the same day after Facebook’s might just be a coincidence enabled by incentive packages, or it might be an attempt to steal Facebook’s thunder. Regardless, two web giants striving to make computing faster, more efficient and in Facebook’s case, more open, is a good thing: both for Iowa and for the rest of us. State of the knowledge about computing efficiency starts with algorithms. Google has orders of magnitude advantage over competitors. With fewer flops, Google uses computers with fewer nanojoules/flop, makes sure high speed/low power memory is located in the same server blade, puts hundreds of servers in liquid cooled racks, uses large pipes to minimize friction as heat exits the facility … if Google power management only 20% better at each step it might be 10x better at the end of twelve steps. Its not a PR race, its more like a Ford Assembly line in 1920. There is so much room for improvement at each step that industrial engineers can save/make $Bs. Too bad the efficiency is a bad word crowd don’t get it. Let them eat coal. Hey wait, that’s where my data is going? Good article on where a big chuck of cyberspace will physically live, also not to mention that it’s great business for Iowa. Data center power usage is absolutely incredible and only growing… Did some research on how fuel cells are very good at supplying efficiently this power and also if strategically close to municipal wastewater treatment plants all the better … 3 birds with 1 stone!! !